If you have ever studied the Jewish Feasts and history, you will know that God does things on His feast days. Did you know that both temples were destroyed on the same day of the year? The first temple, known as Solomon’s Temple, was destroyed in 586 B.C. on the 9th of Av. Herod’s temple, the second temple, was destroyed in 70 A.D. on the 9th of Av. This day of the year is called Tisha B’Av or the National Day of Mourning for the Jews. If you research this day throughout history, you will learn that many bad things have happened to the Jews on this day. One of these events occurred in 1492 in Spain. Just a week or so after Columbus set sail for America, all the Jews were expelled from Spain on the 9th of Av. Would you like to also know what happened in 1492, 4 blood moons on Jewish Feast Days. A blood moon is a lunar eclipse. God used blood moons in the Bible as a sign to the Jews of the great and awesome day of the Lord. “And there will be signs in the sun, in the moon, and in the stars; and on the earth distress of nations, with perplexity, the sea and the waves roaring; men’s hearts failing them from fear and the expectation of those things which are coming on the earth, for the powers of heaven will be shaken. Then they will see the Son of Man coming in a cloud with power and great glory. Now when these things begin to happen, look up and lift up your heads, because your redemption draws near” (Luke 21:25-28 NKJV). “I will show wonders in heaven above And signs in the earth beneath: Blood and fire and vapor of smoke. The sun shall be turned into darkness, And the moon into blood, Before the coming of the great and awesome day of the LORD. And it shall come to pass That whoever calls on the name of the LORD Shall be saved” (Acts 2:19-21 NKJV). Do I think something bad will happen on these days? I have no idea, but I will keep my eyes open for the next two years. We need to pay attention to what God might be saying to us. 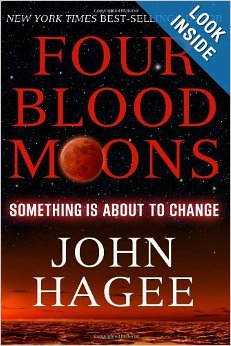 To find out more about these blood moons and a better explanation of what they are, I recommend reading John Hagee’s book, Four Blood Moons.